Spares on Web sell spare parts for white goods, home & garden, commercial kitchens and laundry technology as well as smaller appliances. Spares on web has got a large selection with over 30.000 spare parts in stock for all known brands and we are constantly expanding our range to accommodate the needs and demands of our customers. If you have got the appliance - we have got the spares. Today all of our customers can purchase spare parts for common white good categories with spares for cooker hoods, fridges, freezers, stoves, ovens, microwave ovens, dishwashers, tumble dryers, washing machines, as well as smaller electronic appliances where we among others have spares for shavers, coffee makers, kitchen appliances and vacuum cleaners. We have also acquired two new categories: ”Spare Parts – Home & Garden” as well as ”Commercial Kitchen & Laundry Technology”. Within these categories you will find spare parts for gas grills, air purifiers, and dehumidifiers, as well as spare parts for professional white goods and kitchen appliances e.g. professional drying cabinets, espresso machines and deep fryers. 70 years of experience with white goods. Time has run out for the chromed ’use and toss- culture’ and over usage of new white goods and smaller electronics. 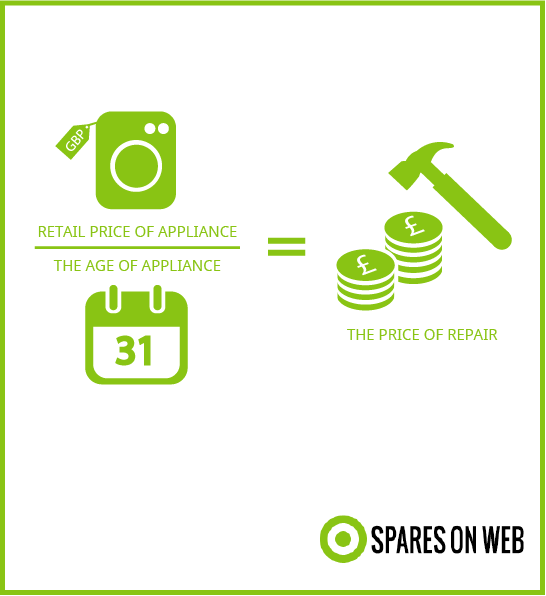 Since 2013 Spares on web has been selling spares parts for white goods and helped thousands of DIY people with their home repairs. Although you cannot bring Spares on Web home to perform the repairs, we are here to help you via email and phone to guide you –with both finding the right spares and with the repair itself. We wish to be the leading company in Europe – both when it comes to quality and the extent of our range. We pride ourselves on quality and precision – and not least on giving you the best possible service. Our 21 staff members have been carefully selected and together they have over 70 years of experience within the white good industry. They will be sharing this experience with you, so you will be able to perform repairs on your white goods in the best possible way. Repair and save money and the environment. Do you wish to save money by repairing your present white goods instead of buying new ones? Then Spares on Web is the right place for you. We can help you repair your present white goods, if they need fixing – at Spares on Web we have made it our mission to make the process of performing minor repairs on all types of white goods in the household simple, easy and accessible for everyone. 3 good reasons for repairing your own white goods. It will pay off repairing your white goods, if the price of the repair does not exceed the price of a new appliance divided by the age of the appliance. With this rule of thumb, you can easily calculate whether repairing your white goods will pay off. See more here. It is cheap to do it yourself. You can often save hundreds of pounds by repairing your white goods as opposed to getting rid of them and purchase new ones. If your heating element in your washing machine is defective, the washing machine won’t be functioning. Instead of buying a completely new appliance, which will cost hundreds of pounds, you can replace the heating element. This will cost between 20-50 pounds. It will cost you money if you do not repair your white goods. The ’use and toss – culture’ is an expensive way of living. Not just for your wallet – but also the environment. So do think about green economy and sustainability, when you have white goods, which are in need of a repair.